The Vegan Mouse: VeganMoFo: Happy Thanksgiving! Hope you all are having a wonderful Thanksgiving with your loved ones. Had a wonderful dinner with my husband, parents and brother today. I spent most of the day cooking up some great food. I wish I had taken more pictures but I was so busy! 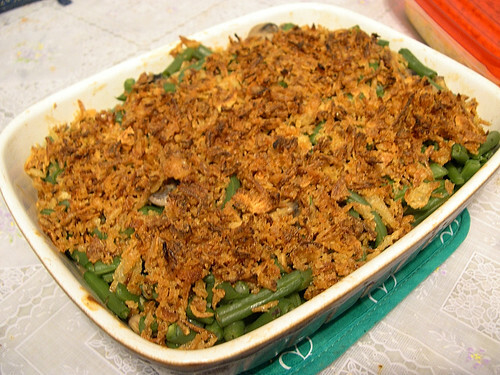 This is a shot of Susan V's vegan green bean casserole. I absolutely love this. I don't miss the ones I had as a girl, you know the one with canned green beans and cream of mushroom soup! This one uses fresh green beans and a made from scratch creamy mushroom base, without the dairy! Whoa baby that's a loaded plate of food! Let's start on the left and go clockwise: Tofurky roast slices covered in "giblet" gravy, cranberry and mandarin sauce, stuffing, mashed potatoes and orange herb gravy, green bean casserole, roasted sweet potatoes, roasted brussels sprouts, dijon glazed carrots. It was all DELICIOUS. 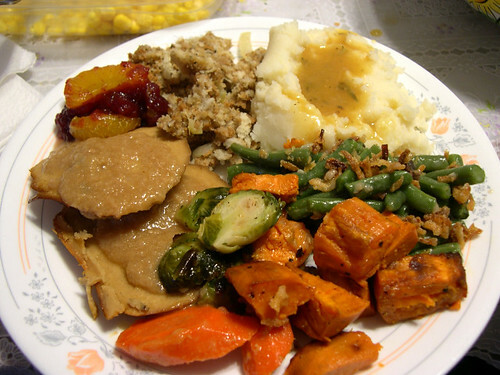 I'm happy that as a vegan, I'm not missing any comfort foods that I remember from Thanksgivings past. I've pretty much covered all the bases. Can't have Thanksgiving dinner without dessert! 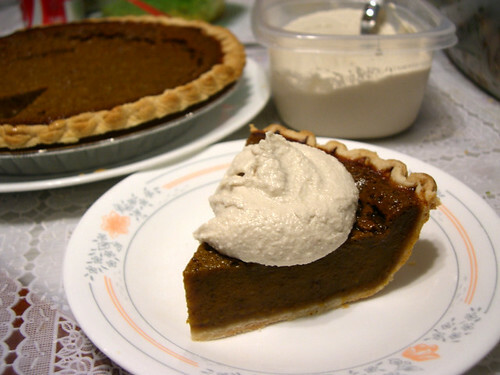 This is Bryanna's pumpkin pie with a delectable maple sweetened cashew cream. FIVE STARS. I loved this spicy custardy pie. Looking forward to leftovers! WOW! All of that looks fantastic! My mouth is watering all over again over here. That pumpkin pie looks like a winner! That looks amazing! And you have 2 gravies!! Is that normal or just something you do? It's freaking genius what ever. I was worried I had made Bryanna's pie wrong because it was so dark (yet delicious). I see from your picture that was just how it was supposed to look! holy cow, it all looks so good I can't believe it. Your bizness is definitely going in the round up today!! beautiful! That vegan pumpkin pie looks incredible!! Every time I visit your site I get so hungry! I want you to come cook for me! VeganMoFo: Mediterranean Dinner Party Food.